Stock Rover Review 2019 – Is This The Right Scanner For You? Without a doubt anyone who joins Stock Rover will recognize it as one of the most powerful equity research platforms available to both private and institutional investors. Thus we‘ll evaluate once again whether the comprehensive and diverse offer is easy to handle and suitable for beginners. Of course such a wealth of analysis and data is not free of charge – if one wants to get to the bottom of the matter. Therefore, we also take a look at the wide range of subscription pricing models in comparison with other ​stock screeners within this Stock Rover review. ​​Who Is Stock Rover Best For? ​Stock Rover was founded in 2008 by software engineers and private investors Howard Reisman and Andrew Martin. In search of better technologies to conduct stock analysis regularly for personal investment, they eventually developed a highly sophisticated and powerful stock research platform based on Web 2.0 technology. The goal was to provide users with a comprehensive financial workstation able to perform fundamental and technical analysi​s on investable securities. Ultimately Stock Rover, after years of development, is one of the most advanced ​screeners available on the market. It has always remained true to the provider‘s claim to be powerful yet flexible, but at the same time intuitive and with the many functions easy to use even for beginners. Thus the provider presents the platform in a modern look and feel with optimized tools that are accessible to individual investors and at the same time can provide all the performance required by financial professionals. And: The Stock Rover ​blog, videos and live webinars should provide a high-quality environment for investment education. ​For a novice, the handling of this powerful stock research platform should be fast and intuitive. Thus, the start page or „dashboard“ presents itself in a clear graphic design with the usual sidebar navigation. To begin with, a comprehensive overview of the market in clearly structured blocks is a good starting point: starting at the top left with the performance figures for a portfolio, alongside those prominent indices and other markets. Underneath, the system lists the „Market Movers“ and „Sector Performance“ in two blocks. On the left, the user will find the „most traded“ as well as „winners“ and „losers“ by percentage. The table to the right shows gains and losses for individual sectors after 5 days and positioning within a 25-week range. 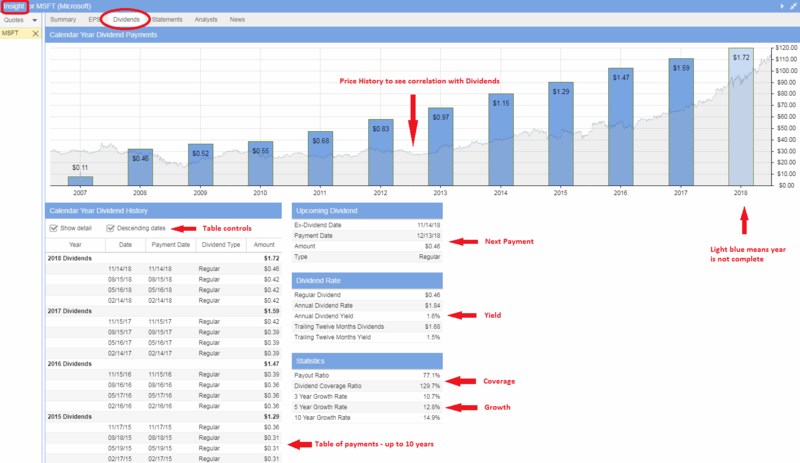 The lower part of the dashboard page is dedicated to „Portfolio Charting“, where the development of one's own or proposed portfolio is shown in charts based on key figures (for example „dividend-adjusted yield“ or „performance“). Below is a list of the performance after further time comparisons and an overview of the portfolio positions. The well-structured sidebar navigation allows you to quickly reach any function, either via the sidebar navigation or via an additional column on the left in the main content area. In addition, the menu contents in the “Main Content” area are clearly arranged using a single or multiple column window (“Table Displays”) with tables and charts to be customized or expanded. In addition to a complete and up-to-date market and news overview, the menu items Quotes, Indices, Portfolios, Watchlists and Sreener provide ample data on the subject of Table Displays. Besides, users can quickly access the tables, charts, insight (facts, key figures, analyzes, news) and a general overview (“All”) via the “Layouts” topic. 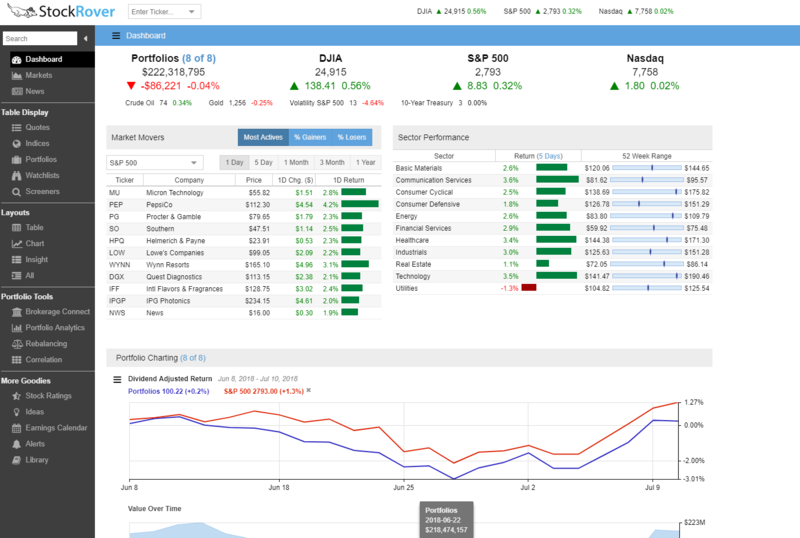 The menu items for the “Portfolio Tools” are: Brokerage Connection, Portfolio Analytics, Rebalancing and Correlation. Among the exclusive features of Stock Rover under the menu “More Goodies” are the following: Stock Ratings, Metric Browsers, Ideas, Earnings Calendar, Alerts and Library. In addition to these many features and extras, it almost seems like a triviality, but maybe one or the other user would appreciate more market data from the areas of currencies, futures or cryptocurrencies, similar to Finviz. Let‘s start with the interesting news for beginners: Stock Rover offers an initially free basic version. In particular, „Stock Rover Free“ membership includes data on more than 10,000 North American equities, over 3,000 ETFs, 40,000 mutual funds, and up-to-the-minute stock market news. With the „Stock Rover Essentials“, which is a kind of basic membership, these free services are enhanced with powerful investment tools for affordable US$ 7.99 per month, US$ 79.99 per year or US$ 139.99 for two years. Investors receive, among other things, more than 240 measurement systems (metrics) and historical data going back five years. In addition, for even more professional needs, requirements there is the „Stock Rover Premium“ membership with many other extras (including 10 years financial history and data export). The price here is US$ 17.99 per month, US$ 179.99 per year or US$ 319.99 for two years. The top offer is „Stock Rover Premium Plus“ with the largest range of services; it costs US$ 27.99 per month, US$ 279.99 per year or US$ 479.99 two years). ​A free Stock Rover test drive with a full 14-day test is possible. You do not have to provide a payment information when registering for the free version or the free trial for the Stock Rover premium plus subscription. Beginners and undecided users will benefit from the free version with access to essential information on over 10,000 North America stocks, 3,000 ETFs and 40,000 mutual funds. ​The free and non-binding 14-day trial of the „Premium Plus“ membership is the suitable way for a really complete check against one‘s own requirements. ​Stock Rover ​is a​ very professional ​investment research platform. It comes with a clearly structured design, clever functionalities and features. In September 2018 Stock Rover annouced new features like the "Dividend Insights", "Comparative Quarterly Statements" and "Percentage Change from Previous Period" for Stock Rover V7. With these new capabilities Stock Rover ​became even more attractive. Trustful sources like Morningstar Inc., Zacks and Intrinio serve additional data like financial statements along with real time pricing data provided by IEX. There are three priced usage options ranging from US$ 7.99 to US$ 27.99 per month, with the 2-year subscription once again lowering monthly prices to sums from US$ 5.83 to US$ 19.99 per month. A remarkable price-performance ratio! 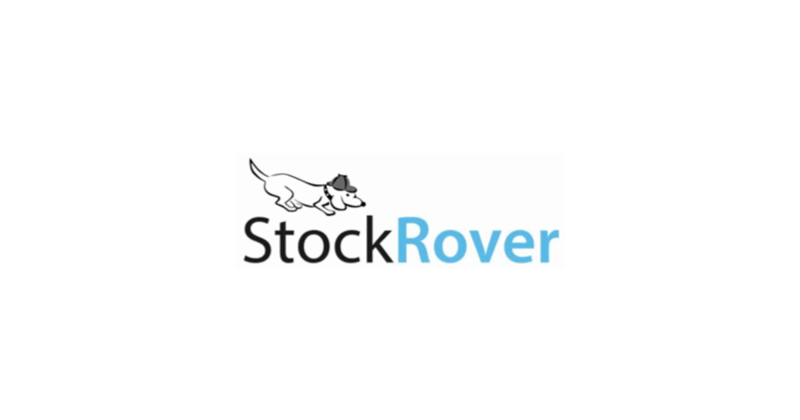 Stock Rover is definitely one of the best stock screeners available right now.